The μ-opioid receptors (MOR) are a class of opioid receptors with a high affinity for enkephalins and beta-endorphin, but a low affinity for dynorphins. They are also referred to as μ-opioid peptide (MOP) receptors. The prototypical μ-opioid receptor agonist is morphine, the primary psychoactive alkaloid in opium. Three variants of the μ-opioid receptor are well-characterized, though reverse-transcriptase PCR has identified up to 10 total splice variants in humans. MOR can mediate acute changes in neuronal excitability via "disinhibition" of presynaptic release of GABA. Activation of the MOR leads to different effects on dendritic spines depending upon the agonist, and may be an example of functional selectivity at the μ-receptor. The physiological and pathological roles of these two distinct mechanisms remain to be clarified. Perhaps, both might be involved in opioid addiction and opioid-induced deficits in cognition. Activation of the μ-opioid receptor by an agonist such as morphine causes analgesia, sedation, slightly reduced blood pressure, itching, nausea, euphoria, decreased respiration, miosis (constricted pupils), and decreased bowel motility often leading to constipation. Some of these effects, such as analgesia, sedation, euphoria, and decreased respiration, tend to lessen with continued use as tolerance develops. Miosis and reduced bowel motility tend to persist; little tolerance develops to these effects. Opioid overdoses kill through apnea and fatal hypoxia, often caused by combination with ethanol, benzodiazepines, or barbiturates. Substantial tolerance to respiratory depression develops quickly, and tolerant individuals can withstand larger doses. However, tolerance to respiratory depression is lost just as quickly during withdrawal. Many overdoses occur in people who misuse their medication after being in withdrawal long enough to lose the tolerance to respiratory depression. Less commonly, massive overdoses have been known to cause circulatory collapse. ^ Zhorov BS, Ananthanarayanan VS (March 2000). "Homology models of mu-opioid receptor with organic and inorganic cations at conserved aspartates in the second and third transmembrane domains". Arch. Biochem. Biophys. 375 (1): 31–49. ^ Dortch-Carnes J, Russell K (2007). "Morphine-stimulated nitric oxide release in rabbit aqueous humor". Exp. Eye Res. 84 (1): 185–90. ^ Pan L, Xu J, Yu R, Xu MM, Pan YX, Pasternak GW (2005). "Identification and characterization of six new alternatively spliced variants of the human mu opioid receptor gene, Oprm". Neuroscience. 133 (1): 209–20. ^ Eisenberg RM (1994). "TRIMU-5, a μ2-opioid receptor agonist, stimulates the hypothalamo-pituitary-adrenal axis". Pharmacol. Biochem. Behav. 47 (4): 943–6. ^ Cadet P, Mantione KJ, Stefano GB (2003). "Molecular identification and functional expression of μ3, a novel alternatively spliced variant of the human μ opiate receptor gene". J. Immunol. 170 (10): 5118–23. ^ Stefano GB (2004). "Endogenous morphine: a role in wellness medicine". Med. Sci. Monit. 10 (6): ED5. ^ Chen, Wency (2012). "Opiate-induced constipation related to activation of small intestine opioid μ2-receptors". World Journal of Gastroenterology 18 (12): 1391–6. ^ Liao D, Lin H, Law PY, Loh HH (February 2005). "Mu-opioid receptors modulate the stability of dendritic spines". Proc. Natl. Acad. Sci. U.S.A. 102 (5): 1725–30. ^ Liu X-Y, Liu Z-C, Sun Y-G, Ross M, K S, Tsai F-F, Li Q-F, Jeffry J, Kim J-Y, Loh HH, Chen Z-F. "Unidirectional Cross-Activation of GRPR by MOR1D Uncouples Itch and Analgesia Induced by Opioids". Cell 147 (2): 447–458. ^ Martini L, Whistler JL (October 2007). "The role of mu opioid receptor desensitization and endocytosis in morphine tolerance and dependence". Current Opinion in Neurobiology 17 (5): 556–64. ^ Zuo Z (September 2005). "The role of opioid receptor internalization and beta-arrestins in the development of opioid tolerance". Anesthesia and Analgesia 101 (3): 728–34, table of contents. ^ Marie N, Aguila B, Allouche S (November 2006). "Tracking the opioid receptors on the way of desensitization". Cellular Signalling 18 (11): 1815–33. ^ DuPen A, Shen D, Ersek M (September 2007). "Mechanisms of opioid-induced tolerance and hyperalgesia". Pain Management Nursing : Official Journal of the American Society of Pain Management Nurses 8 (3): 113–21. ^ Garzón J, Rodríguez-Muñoz M, Sánchez-Blázquez P (May 2005). "Morphine alters the selective association between mu-opioid receptors and specific RGS proteins in mouse periaqueductal gray matter". Neuropharmacology 48 (6): 853–68. ^ Hooks SB, Martemyanov K, Zachariou V (January 2008). 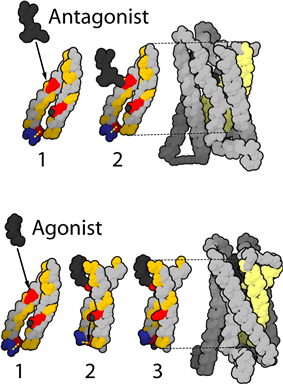 "A role of RGS proteins in drug addiction". ^ Sirohi S, Dighe SV, Walker EA, Yoburn BC (November 2008). "The analgesic efficacy of fentanyl: relationship to tolerance and mu-opioid receptor regulation". Pharmacology, Biochemistry, and Behavior 91 (1): 115–20. ^ Lopez-Gimenez JF, Vilaró MT, Milligan G (November 2008). "Morphine desensitization, internalization, and down-regulation of the mu opioid receptor is facilitated by serotonin 5-hydroxytryptamine2A receptor coactivation". Molecular Pharmacology 74 (5): 1278–91. ^ Kraus J (2009). "Regulation of mu-opioid receptors by cytokines". Frontiers in Bioscience (Scholar Edition) 1: 164–70. ^ García-Fuster MJ, Ramos-Miguel A, Rivero G, La Harpe R, Meana JJ, García-Sevilla JA (November 2008). "Regulation of the extrinsic and intrinsic apoptotic pathways in the prefrontal cortex of short- and long-term human opiate abusers". Neuroscience 157 (1): 105–19. ^ Ueda H, Ueda M (2009). "Mechanisms underlying morphine analgesic tolerance and dependence". Frontiers in Bioscience 14: 5260–72.